Even though research has shown that Fibromyalgia does not have inflammation as a marker, is it possible that it does? New research is pointing to inflammation and has shown that cytokine levels are excessively high in patients that have had Fibromyalgia for over two years. Now, it hasn't been determined whether this in itself is a cause or if it's secondary to the condition. Research has also shown that chronic inflammation and an altered immune system may be a cause of Fibromyalgia. I read an article that Dr. Dennis Ang, a rheumatologist, had a hunch. People with Fibromyalgia have an increased number of mast cells. Mast cells have been shown to be implicated in inflammatory diseases when activated by non-allergic triggers. Dr. Ang's hypothesis is that if you quiet these mast cells, which usually are allergy related, then you might be able to control the pain. The drug he's using is Ketoifen. This drug is sold worldwide but in the United States it is only available in an eye drop. Dr. Ang is conducting trials right now. I'll include the link to the article at the bottom of this post. 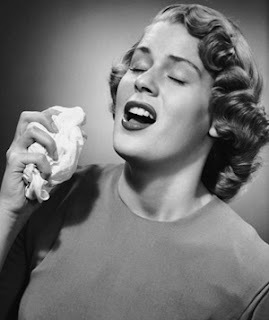 We're just a sneeze away from being pain free?